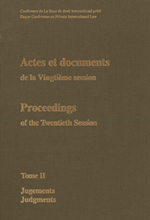 The Permanent Bureau of the Hague Conference on Private International Law is pleased to announce that the volume of the Proceedings of the Twentieth Session, Tome II, Judgments has recently been published. National Organs and Contact Organs of Members and participants in the Twentieth Session (14 to 30 June 2005) will receive copies of the Tome in the coming weeks. All others can order Tome II. This book can be ordered online through Intersentia Publishing.